Hormones are chemical messengers. Hormones work to ensure that we consume the right amount of food we need to fuel our bodies each day. They are responsible for signaling to the brain when it’s time to start eating and also when to stop eating. When these signals don’t function properly, this can promote obesity. The complex interplay between the glands, hormones and other target organs is referred to as the endocrine system. The endocrine system is one of two main communication systems in the body together with the nervous system. Endocrine glands are small organs that make and release hormones directly into the bloodstream. The endocrine system in the body produces hormones to provide an internal communication system between cells located in distant parts of the body. Underproduction of a certain hormone. Overproduction of a certain hormone. A malfunction in the production line of a hormone or in its ability to function correctly. Some endocrine conditions are due to a benign growth in the affected gland or when the cells in that gland stop functioning properly, while others are caused by genetic factors. 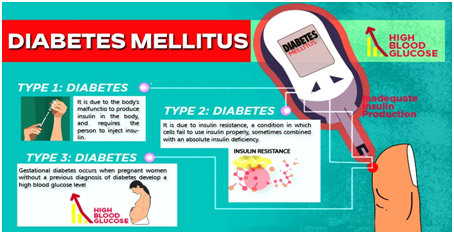 Diabetes mellitus is a condition in which the body does not produce enough of the hormone insulin, resulting in high levels of sugar in the bloodstream. There are many different types of diabetes; the most common are type 1 and type 2 diabetes. 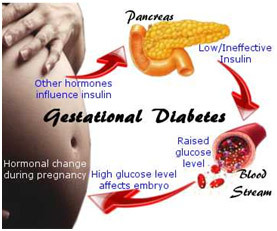 Gestational diabetes occurs normally during the second half of pregnancy but in Indians, it can be earlier. There are a range of different symptoms in people with diabetes. They may feel thirsty, pass a large amount of urine, wake up overnight to pass urine, lose weight and have blurred vision. Patients are vulnerable to infections such as thrush and may present with this. Gestational diabetes is any level of sugar in the bloodstream above the normal range, which is first diagnosed during pregnancy. Blood glucose levels usually return to normal after the birth. However, some women who are diagnosed with diabetes during pregnancy may have had diabetes before becoming pregnant, but had not been tested before the pregnancy. Gestational diabetes may not cause any symptoms but even so, if not diagnosed, may still cause problems for both mother and baby. Gestational diabetes can result in bigger babies, so women whose babies seem to be big may be offered a test for gestational diabetes. In medicine when a doctor specialises in diagnosing and treating conditions that are caused by, or that affect your hormones, they are called an endocrinologist.